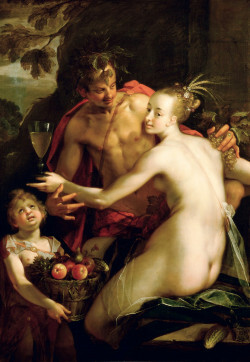 Hans von Aachen (1552 – 4 March 1615) was a German artist, one of the leading painters of Northern Mannerism. He was trained in the tradition of Netherlandish Renaissance painting but then spent 14 years in Italy, based in Venice, before returning to Germany, but to Bavaria in the south-west rather than his native Rhineland in the north-east. He was a versatile and productive artist, though preferring to work on a small scale; many of his works are cabinet paintingson copper. 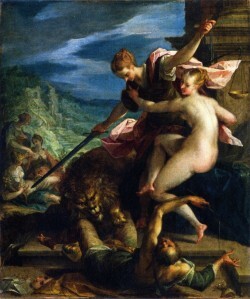 He was successful as a painter of princely and aristocratic portraits, and was also able to turn his hand to religious and mythological subjects, as well as the eroticized allegories enjoyed by the patron of his last years, Emperor Rudolph II. These remain the works for which he is best known. 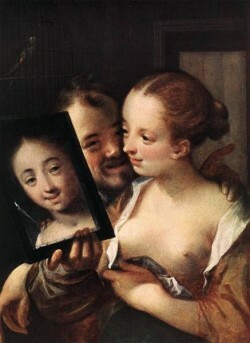 He also painted a number of genre paintings of small groups of figures shown from the chest upwards, laughing, often apparently using himself as a model. 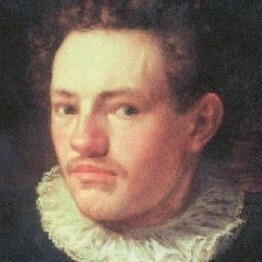 He remained based in Munich for several years after being appointed court artist to Rudolf in 1592, but finally moved to Rudolf's capital in Prague, where he died, having outlived his master's downfall and death by a few years; unlike most of Rudolf's artists he was retained by his successor Matthias I. Rudolph also used him as an advisor on his art collecting and what is usually called a "diplomat"; in other words he travelled to the owners of art collections to convey the emperor's often shameless bullying to make them accept his offers for their treasures. Although he did not produce prints himself, his paintings were much reproduced by other artist's in Rudolph's stable, and became well known and influential across Europe, although the Mannerist style fell from fashion soon after his death. The first major exhibition devoted to him was in Aachen, Prague and Vienna in 2010.